Batwoman seeks reassurance from the Batman that the Insurgency is not defeated. Batman does that, then contacts Hawkman through Lex Luthor, who promises to aid Batman and his cause. Regime Superman ventures to Khandaq, to shore up his ranks, after having issues with the Flash. A fight ensues with Black Adam, but Adam's allegiance is secured. Story - 1: A fight between Black Adam and Regime Superman should never be boring, but Injustice has become so overstretched for a story, aye, for mere direction, that something which should provide grand entertainment is little more than a nuisance. Both Batman and Regime Superman are hollow shadows of what they once were at the series height, i.e. Year Two, which saw Regime as a formidable threat, and Batman as something of a hindrance, but a viable one. Now the Batman sits at computer screens and is doubted when he should be left a la Catwoman's actions. He has no plan, no resources, no hope, and readers already know he is not going to win this war against the Regime. Regime Superman's face has been bloodied one too many times for him to be taken seriously any longer. With loses to Alfred, Wonder Woman, and Batman, he needs to have his status reaffirmed; instead we see him in an inconsequential fight with Black Adam, where the League once more has to save his bacon. 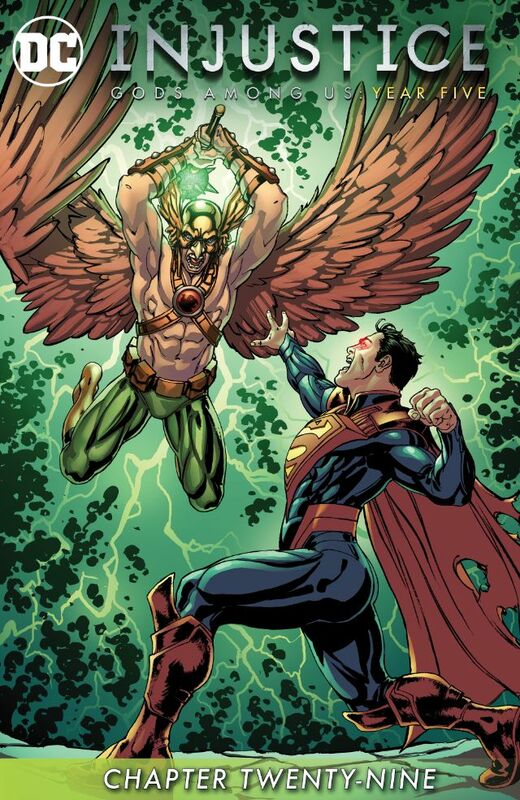 I don't hold out any hope for improvement with Hawkman coming into play again; I smell Kryptonite and lackluster event among us. Art - 4: It's the first time in a while that Regime's outfit has been drawn correctly... and well at that. The Khandaq scenes in Adam's throne room are top as well, and, as usual, one can only wonder what may be done, if there was greater story to depict.